Statistics suggest spinners concede fewer runs at the death than fast bowlers, so why are they still so rare in that period? In all phases of a T20 match, spinners have a better economy rate than seamers. Although universally accepted as crucial to any successful T20 side, "the bottom line is - yes, spinners are possibly being underbowled and underplayed," according to Srinath Bhashyam, formerly deputy general manager at Sunrisers Hyderabad and now the head of operations at Delhi Capitals. Yet some T20 teams have used a spin-to-win strategy to great effect. From 2010 through 2015, Chennai Super Kings reached five IPL finals in six years. Turning wickets at the Chidambaram Stadium and a supreme spin attack underpinned their success. In the 2010 IPL, for instance, they regularly picked three spinners: the offspinner R Ashwin, the left-armer Shadab Jakati, and Muttiah Muralitharan, who could be best understood as a mystery spinner. Supplementing them were the part-time offbreaks of Suresh Raina. When they successfully defended their total to win the final that year, Chennai bowled 13 overs of spin. When they retained their crown in 2011, they opted again to bat first in the final, and bowled 12 overs of spin. In recent years no one has embraced spin more than Afghanistan. Led by the legspin of Rashid Khan, they are fortunate to have formidable variety in their attack - the mystery spin of Mujeeb Ur Rahman, the offbreaks of Mohammad Nabi, the left-arm spin of Amir Hamza. Their "home" pitches, in India, and before that the UAE, suit them perfectly. In franchise cricket Guyana Amazon Warriors are the leaders. Since April 2013, 51% of their overs have been bowled by spinners, more than any other T20 franchise in the world, and second only to Afghanistan's 56. Guyana's home ground, Providence Stadium, is regarded as treacherous for opponents. The surface is slow and takes an unusual amount of turn, making it particularly hard to play cross-batted shots. The conditions hinder batsmen from generating timing and power. "I struggled in Guyana with the general lack of pace and bounce in the pitch," explains keeper-batsman Luke Ronchi, who arrived there after a remarkable run of T20 form around the world. "The wicket in Guyana was a lot slower and lower." Guyana have cultivated a bowling attack tailor-made for the conditions. Last season their strategy was based around Imran Tahir, a legspinner, and Chris Green, an offspinner who bowled a very tight line, often barely turning the ball, with strong support from left-arm spinner Veerasammy Permaul, legspinner Devendra Bishoo and offspinner Shoaib Malik. "Our spin bowlers did a great job in the Powerplays," says Ronchi. "Then Tahir outside of the Powerplay was awesome." 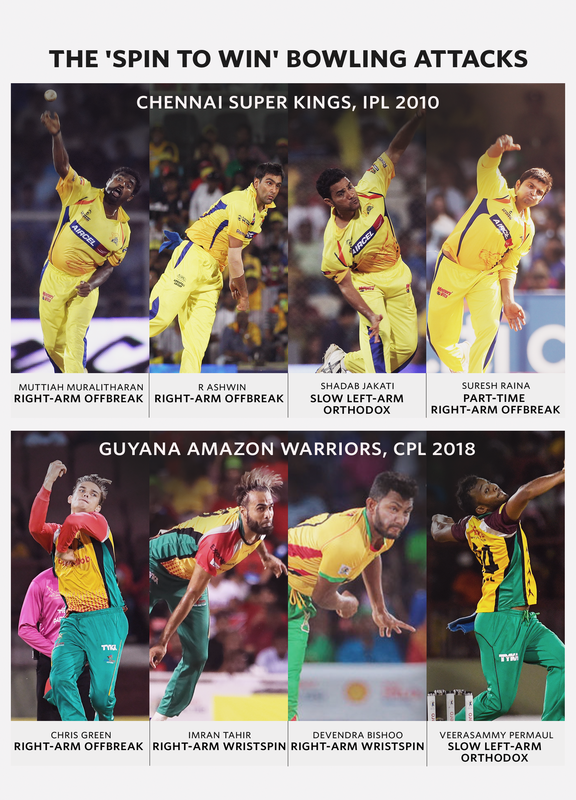 Guyana's undemonstrative, easily overlooked team twice beat Trinbago Knight Riders, the Caribbean Premier League's standout side, in Providence en route to the final. In the CPL the importance of spin is such that teams with two spin bowlers who have played international cricket win 60% of games, finds Joe Harris of White Ball Analytics. Those with one international spinner win 52.6%, while those without any win just 38.7%. Guyana's success has a lot to do with their embrace of spin's importance, and a remaining inefficiency in the T20 market. "Teams definitely don't use enough spin," says Harris. "However, it obviously depends on who you have in the team. One day we will reach an equilibrium where spinners are not underutilised to the extent they are now. The trend is headed in the right direction." Although there is an uptick in the number of overs bowled by spinners, it isn't pronounced. This has created opportunities for savvy teams. Orthodox left-arm spinners are viewed as particularly good value. The curious thing is that spinners are still bowled the least when they are most effective. The lingering fear is that if spinners are lined up by batsmen at the death, they could concede 15 runs or more an over. Yet from January 2016 to July 2018, in the last five overs of matches, according to CricViz, seamers conceded 9.58 an over and spinners just 8.54, thus saving more than a whole run every over. Teams may have been coy to bowl spinners at the end except in spin-friendly conditions, which could in part explain their superior figures at the death - but even excluding Rashid and Sunil Narine, two of the best in the business, spinners still only conceded 8.75 an over in the last five overs. Teams remain wary of selecting two front-line spinners of the same style. Yet while an optimal spin attack would contain a legspinner, an offspinner and a left-arm orthodox spinner (or ideally a left-arm unorthodox, but they are as rare as Faberge eggs), sides have been successful fielding multiple front-line bowlers who bowl the same type of spin. In 2013, Sunrisers Hyderabad reached the playoffs after routinely picking legspinners Amit Mishra and Karn Sharma in the XI. In 2016, Jamaica Tallawahs won the CPL with three left-arm spinners who had economy rates of under seven an over - they picked all three in nine of their 13 matches. Perhaps in the years ahead, spinners will go from being the most effective bowlers in an attack to the most common, and - as they do in Providence - regularly bowl at least half the overs in an innings. What do the successes of Sunrisers Hyderabad, Perth Scorchers and Pakistan in T20 have in common?